Characteristics of a route can be represented as a linear event with starting and ending measure information along the route. The Add Linear Events widget provides an interface to add linear events into the geodatabase. You can also use referent offset data and stationing to add events to a route. The referent offset data is translated to routes and measures for storage. 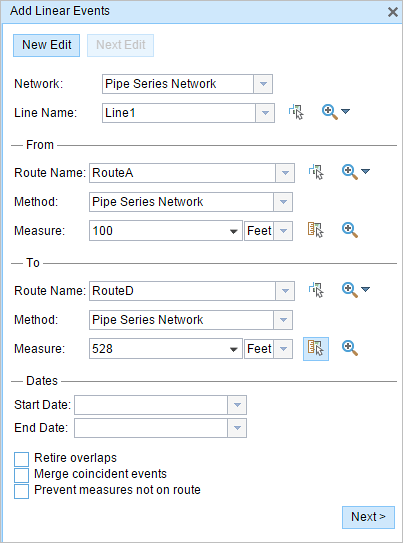 ArcGIS Pipeline Referencing for Server allows you to add events that span routes that are part of a line. As shown in the example below, RouteA, RouteB, RouteC, and RouteD are part of the same line. An event with ID Event1 that spans between RouteA and RouteD is added using the Add Linear Events widget. The events that span routes can only be added to the networks that support lines. You can also add events in the reverse direction of calibration of the route; for example, you can provide a From measure value greater than the To measure value for the events on the Add Linear Events widget. The resulting events in this case are created with the lesser value as the From measure and the greater value as the To measure. If the event ID field in the event layer is not a string data type (minimum 32-character length), Event Editor (EE) will not provide an event ID and will not support editing of that event. It’s important to model internal events with an event ID. For more information, see the Event Editor (EE) deployment guide. In cases where events are being modified on a route and you want to see the previous events on the route at that location, don't use the Add Linear Events widget. Instead, edit events in the Event Selection table or the Attribute Set Selection table. If either table is used, you'll see what was previously on the routes at the specified measures. When events spans multiple routes, events do not get time slices based on routes between the From Route and To Route values to minimize the time slicing of the event. The measure is located based on the measure values from the chosen route. The measure is located at an offset distance from an intersection at a chosen route. Intersection layer registered with the chosen network. Point event registered with the chosen network. A starting or base station is identified from the stationing points on the map. The start or end of the event is then located at an offset distance (using a station value) from the base station. Stationing event registered with the chosen network. Only available to locate the To Measure value. The measure is located at an offset distance from the From Measure location. You can use any combination of methods to enter the From Measure and To Measure values. For example, you can use the Select From Measure on the Map tool to choose the From Measure value, and use the reference offset from a point to define the To Measure value along the route on the map. 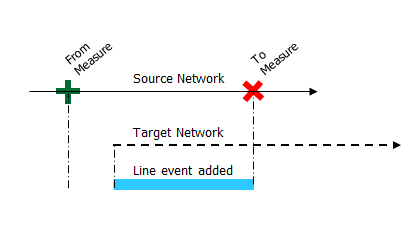 You can specify the LRS Network to be used as a source LRM for input start and end locations for the new linear event. 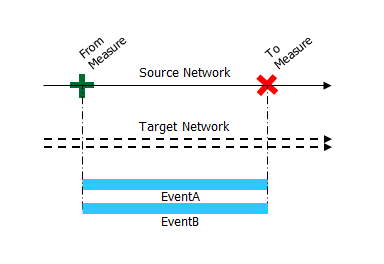 If the chosen LRS Network is not the same as the one where the linear event layer is registered, Event Editor (EE) performs an internal translation of measures to always store the measure value in the LRM of the LRS Network where the event is registered. 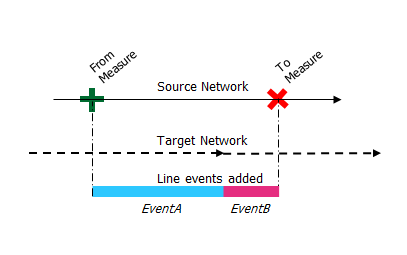 In cases where the input location for the new event does not partially overlap the route in the target LRS Network, the measure values of the linear event created are adjusted to match the shape of the route. In cases where the input location for the new event may intersect more than one route in the registered LRS Network, the linear event is split into multiple events so the shape of the events matches the shape of the route feature intersecting it, and the measure values are adjusted. In cases where the input location for the new event may intersect more than one route (concurrent) in the registered LRS Network, a linear event is created for all the routes in the concurrent section of the input. No one has a lock on the event layers in the attribute set for the route on which the events will be located in any versions of the database. You already have an event lock on the event layers in the attribute set for the route on which the event is located in the same version of the database in which you're currently working. Some or all of the event layers present in the attribute set are already locked by you for the route on which the event is located but in a different version. The route on which the event is located is already locked by a different person.